Lavender is one of the safest, most versatile, gentle oil. Not only is this oil calming and relaxing, it is also anti-inflammatory, antibacterial, antispasmodic, and stimulating to the immune system. Lavender is also great at stimulating new cell growth. The properties of this oil make it great in beauty and health care. It's able to treat eczema, acne, dermatitis, psoriasis, just to name a few. Studies have shown that lavender may be essential to helping with issues such as pattern baldness or alopecia. It can prevent itchy and dry scalp. A study from 2011 shows that it can even prevent lice and may even kill them. To make it more effective, mix with tea tree. Lavender is great in hair treatments because it can help strengthen the hair while adding shine. When used in skin care, it can have a softening and conditioning effect. 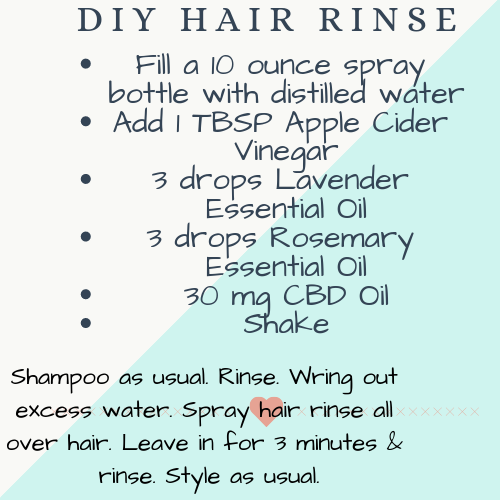 Create your own hair rinse! Shake. Shampoo as usual, rinse. Wring out excess water. Spray hair rinse all over hair. Leave in 3 minutes & rinse. Note: Hair may feel a little tangly when you first use the rinse. This rinse is meant to replace conditioner. Over time your hair's pH will balance and your hair will become more manageable. Your hair will be stronger and shinier without harsh ingredients.